Have you ever had thin slices of lomo at a tapas joint or perhaps have a family tradition of Italian lonzino? This is not going to be a recipe or exact procedure (per usual here.) I do detest measuring and weighing after all. 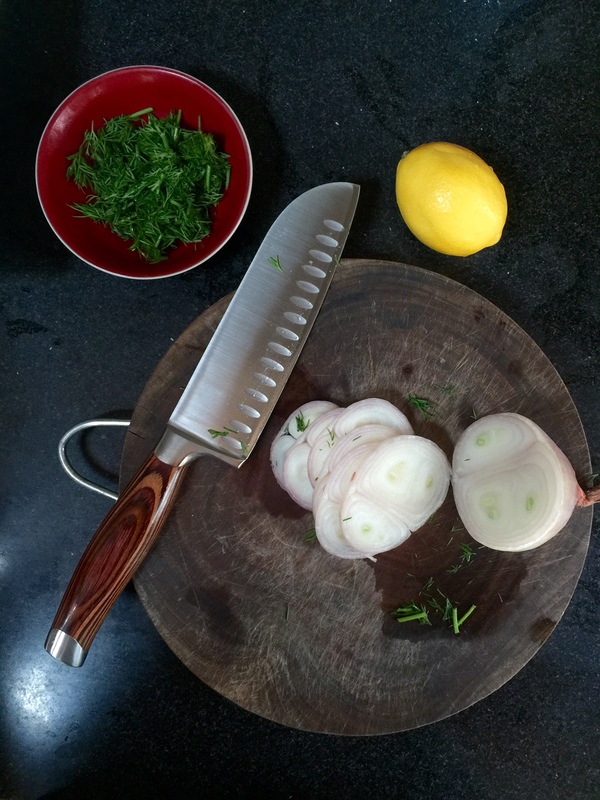 Besides, I have yet to come up with a way to make a mouth watering smokey loin with a strong hint of thyme such as the traditional Romanian kind my father-in-law makes. So far I’ve achieved salty and savoury. I need his secrets and perhaps a smoker. Nonetheless it was an adventure, and maybe someone reading this will be inspired to try their own charcuterie? I began the cure on the 18th of November, and I deemed the pork ready on the 18th of December as it turns out. They were rather large hunks which took a long time. I just began four, as thin as my wrist, yesterday as a second attempt which will go faster. First I washed the pieces and trimmed them a bit to be a more regular size and composition (less fat.) Roughly following a few online guides I salted them including pink curing salt in the mix (which contains nitrates/nitrites which are extremely important to prevent dangerous bacterias from colonising the meat.) This is also supposed to be done by weight for safety reasons. 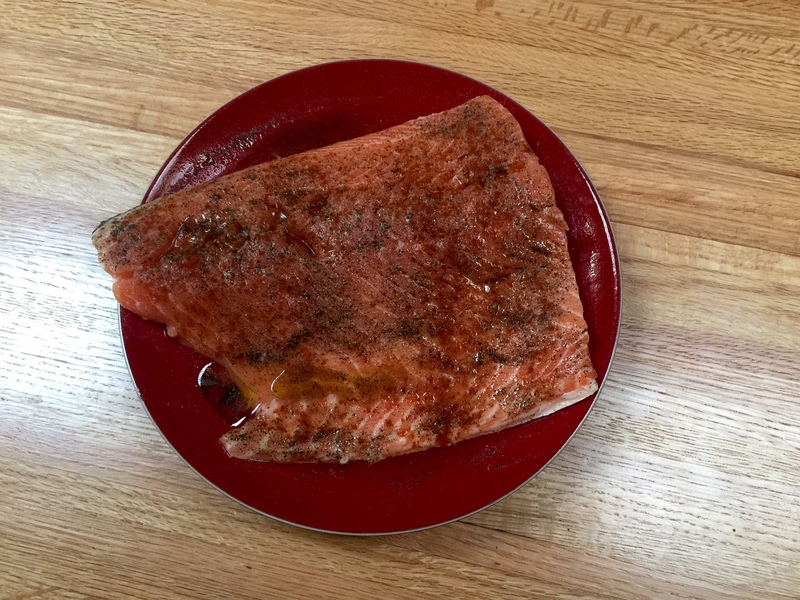 The dry brine included some herbs, liquid smoke, and semi-sweet paprika, but it turned out to not be enough for the flavour I was looking for. The pieces were tightly wrapped and went into the fridge until the 4th. At that point I rinsed them (not well enough fearing they’d be bland… too salty in retrospect,) let them drain for a while, and tied them up to hang in the garage. It didn’t look odd at all, I’m sure. It’s a citrus fruit thing called Buddha’s hand, and I had to get it. I just love trying out new and strange produce. Heh, just ask my mother for stories of shopping with me as a kid and begging for a star fruit or some other foreign looking botanical specimen. (Back then star fruit was really strange, and I remember the first time we started seeing kiwis on offer and marketed with special little spoons. It was the boonies, okay?) Anyway, I didn’t realise that there wasn’t going to be any fruity pulp to try, but luckily I planned to do something involving the zest as I shopped. Often I’ll make a lemon based marinade, so I figured that work with this thing, and grilling sounded tasty… maybe shrimp kebobs? I ended up with boneless chicken thighs. I’d also planned on getting a pork loin to cure, but the store wasn’t running any specials (as they always seem to usually, darn it!) Chicken was dirt cheap though, and after some consideration I went for it. I’m not a big fan of chicken. Generally I kind of dislike it even, and I only prepare it a couple of times a year. Usually I bake thighs covered a bit of mayonnaise, dill, scallions or onion, black pepper, paprika, and garlic salt. Occasionally I’ll dredge cutlets in coconut flour for a sort of schnitzel. Other than soup I think that is pretty much it. I’m just not into chicken. Once I finished putting away the groceries I threw the thighs into a bowl with thin slices of the Buddha’s hand, the juice of a few lemons (after seeing there was no pulp in this thing,) a bunch of garlic salt, a little black pepper, and a little bittersweet Spanish paprika. My idea was to kind of brine it, I guess, hence more salt than usual and put it in the fridge for a few hours before grilling. I didn’t even photograph this since I didn’t plan to blog anything about it. But it turned out to taste AMAZING. This was days ago, so describing it is difficult, but L and I were really, really, really surprised and amazed at just how delicious this chicken was. The flavour ended up penetrating through beautifully, every bite had a delicate and tangy goodness with a bit of the grill char too. Freaking awesome. So, the point of this post is to encourage you to try cooking with Buddha’s hand. 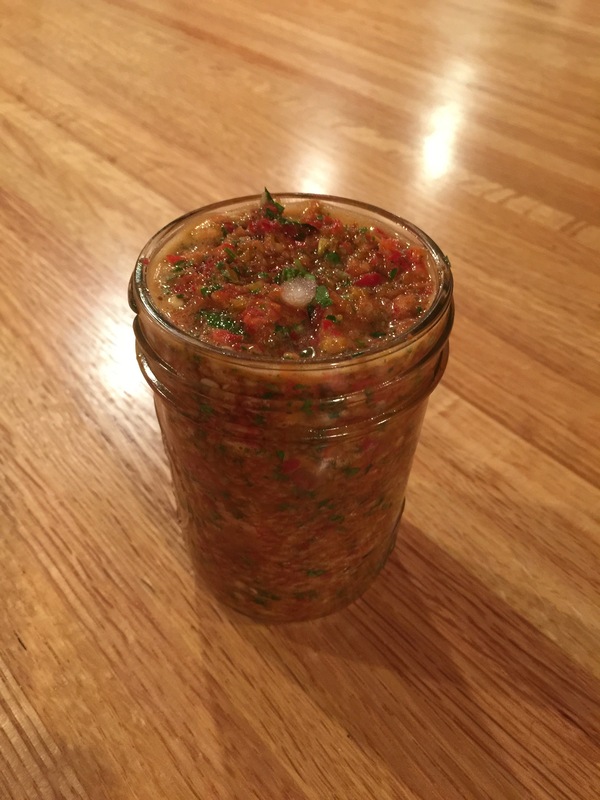 Figure out what went right with my experiment, or Google for recipes, but do try it if you ever see it in the shop. 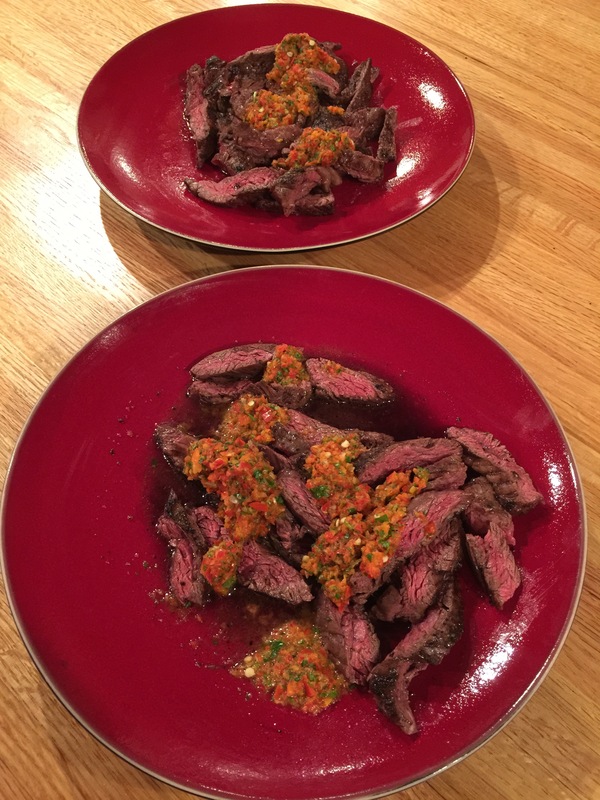 Having skirt steak so often and preparing it simply with salt and pepper means that I’ve been trying some new things to dress it up. Actual chimichurri is delicious and all, but I have been playing with a new food processor and trying different purees to spoon over the steak. 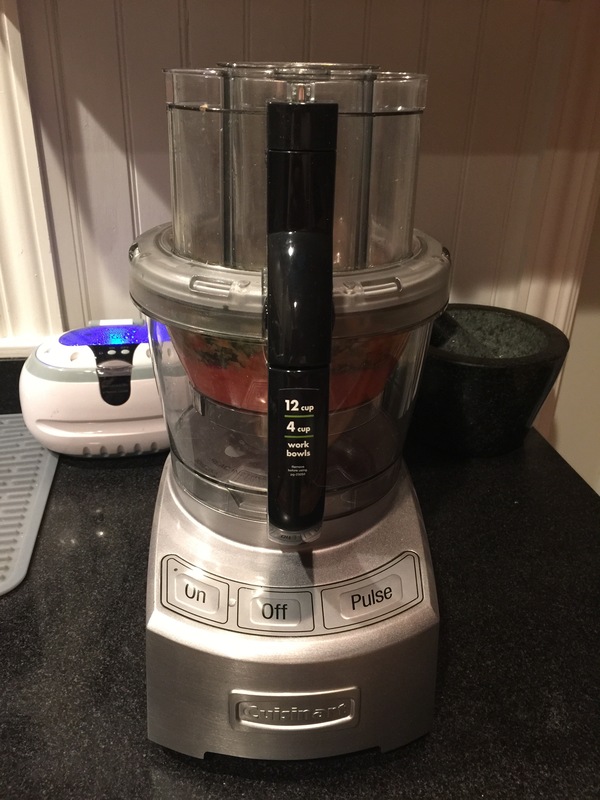 While I prefer not to clutter my countertops and tend to take the long route in all things this appliance has been a big help now that I’m in the city for work and am exhausted by suppertime. The reviews were correct about the gasket being a particle trap, and the smaller bowl isn’t entirely as awesome as it sounded, but it still helps. If I buy another few pieces maybe that would be best since our dishwasher is the world’s slowest (and I agree with some reviewers that this is a machine wash item.) Anyway, I like the look and design a lot too besides having a choice to use less dishwasher space or the big bowl as needed. One night I wanted to use the piquant little nasturtium leaves growing all over for something, and the food processor made it possible to do more than add them to a salad. 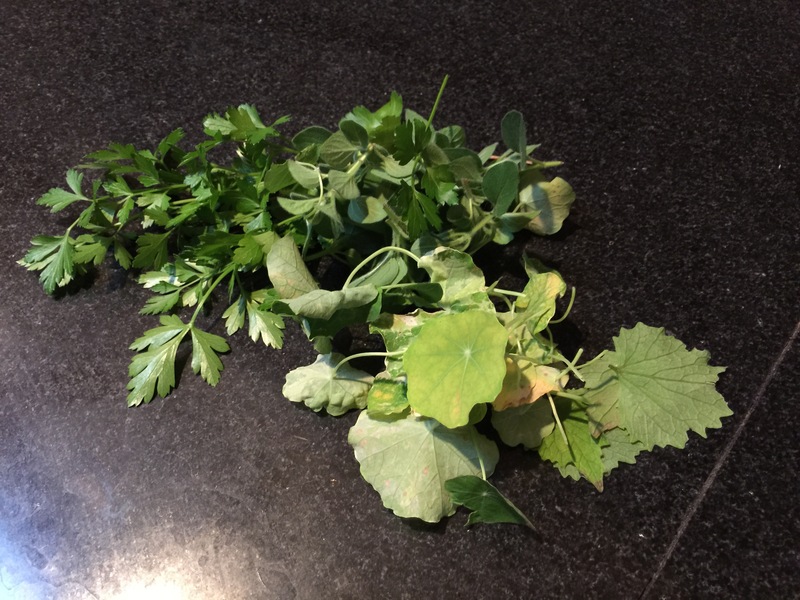 I used a handful of them, some parsley, a red pepper, garlic mustard from the yard, a little onion, and spicy oregano together. Of course I added olive oil, salt, and a bit of vinegar too. Another night I put a garlic clove into the mix since the wild garlic mustard was about done. Either way it is good. 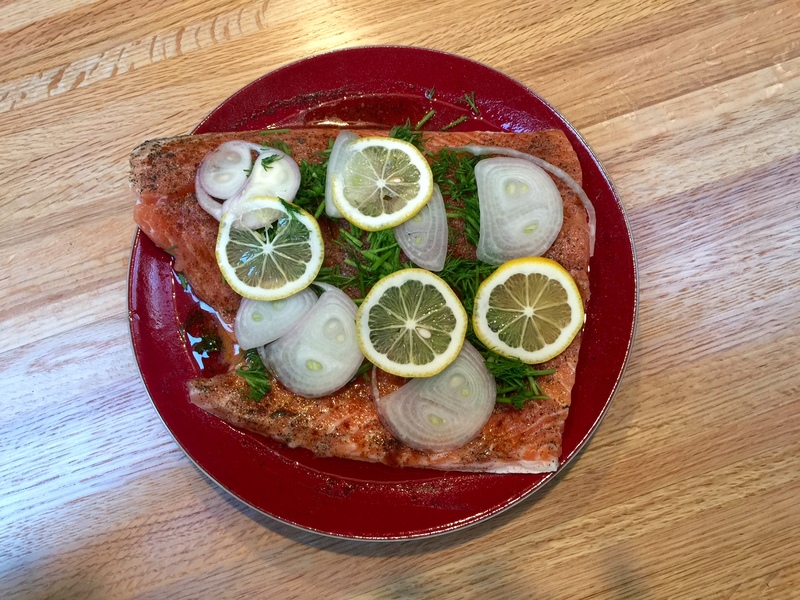 One of the meals that I made for supper recently was salmon on the grill. I’d not tried that before, but it turned out tasty. I began by sprinkling it with garlic salt, hot paprika, and black pepper. 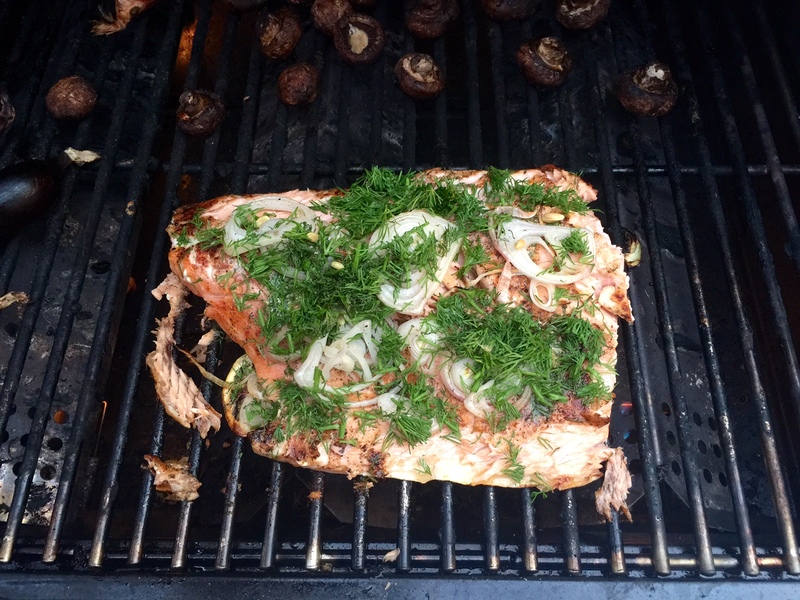 Then I thinly sliced a shallot and a lemon and topped the salmon with them and dill. I squeezed the rest of the lemon over it and drizzled it with olive oil before grilling. Yum!